Researchers at the University of New Hampshire are working on a new tool to combat the apple scourge: A drone. The fungal infection causes dark scabby lesions on the leaves and skin of the apple, which leaves the flavor unaffected, but does effectively make it unsalable. Apple scab is less of an issue in drier regions, such as Washington state. But in places like New York, New Hampshire, Vermont or Massachusetts, apple scab is the number one pathogen and apple farmers’ primary concern. In recent decades, researchers have made strides in understanding the fungus’s life cycle, so farmers are spraying less than they used to, with better results. Some farmers even use predictive models, such as the Dutch program RIMpro to forecast the best spraying times. But apple scab is still a persistent battle, and it’s especially difficult ”“ if not nearly impossible ”“ for organic farmers to grow a scab-free crop. So researchers at the University of New Hampshire are working on a new tool for fighting apple scab: Drones. Researchers Matthew Wallhead and Kirk D. Broders stand with the prototype apple scab drone. 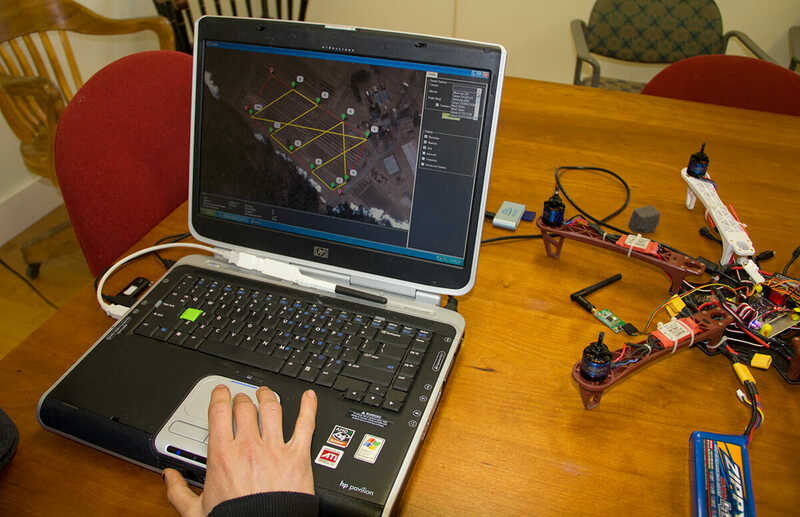 But it is possible with a small unmanned aerial vehicle (UAV), or drone, carrying an infrared camera that takes multispectral images of the orchard. A computer program crunches the wavelengths in each pixel, making it possible to hone in on colors and temperatures ”“ and locate apple scab. Apple scab is visible on some fallen leaves. UNH plant pathologist Kirk D. Broders holds up an apple with a scab. 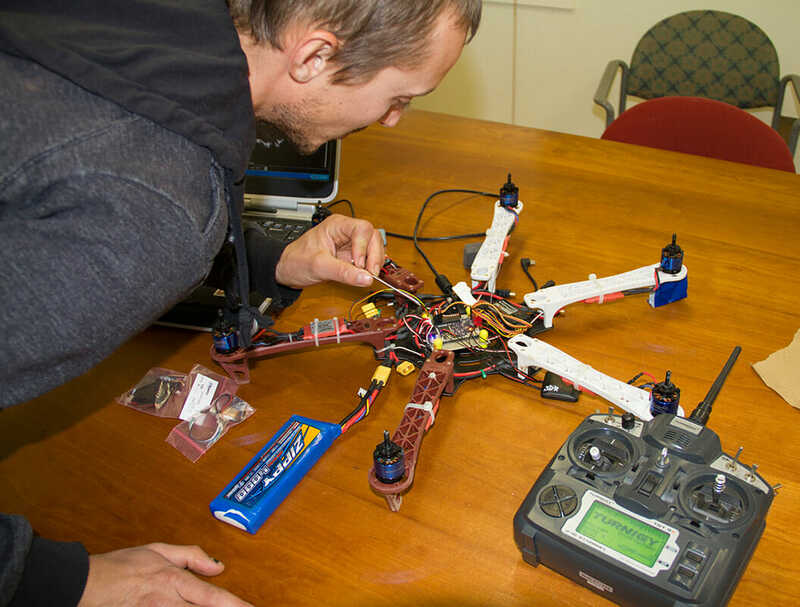 Matthew Wallhead points out the 'brain' of the drone. 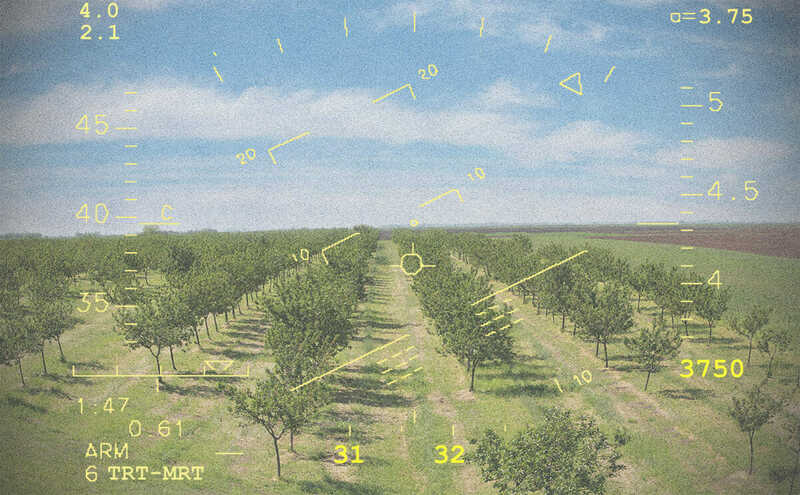 “If you had a UAV that had the capacity to go up once a day, take a digital image or multiple digital images ”“ both in infrared and then in normal spectrum — you could actually monitor your orchard using a $2,000 UAV,” says Broders. Graduate student Matthew Wallhead is leading the project at UNH, and built the first such system this summer for about $2,400. It includes a low-cost surveillance drone from a Massachusetts startup called Rotary Robotics ”“ though Wallhead prefers the term UAV as “the term ‘drone’ has traditionally implied a weaponized system,” he says — and two point-and-shoot digital cameras. Wallhead removed the infrared filters from the cameras using an online tutorial. Broders says the ultimate goal is to develop an orchard-monitoring UAV system that could be sold to growers for under $2,500, though he estimates they’re five years away from an actual product. It’s not the first time that multispectral imaging has been used in agriculture. Researchers have analyzed plants using lab equipment, and large farming operations can hire airplanes to fly over and take multispectral images of large swaths of corn or soybeans to monitor crop health. 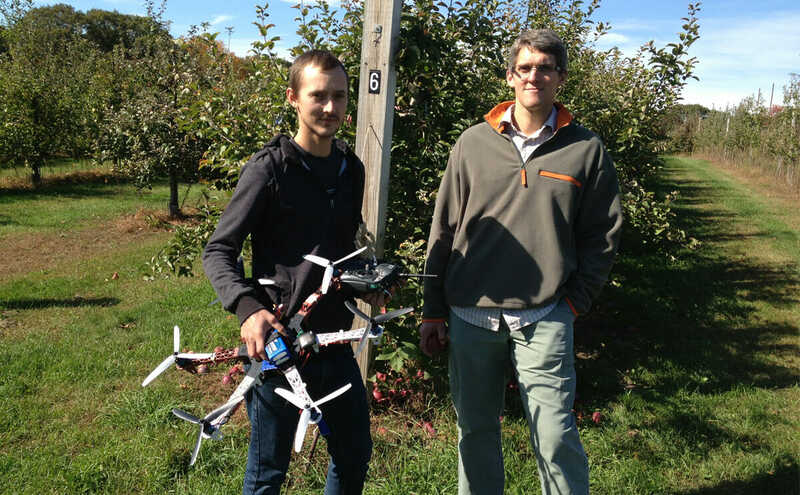 Wallhead and Broders envision apple growers using the drone-camera system in conjunction with the predictive models for apple scab ”“ the real-time data that tell farmers when to spray. Matthew Wallhead charts out a hypothetical autopilot course for the drone. 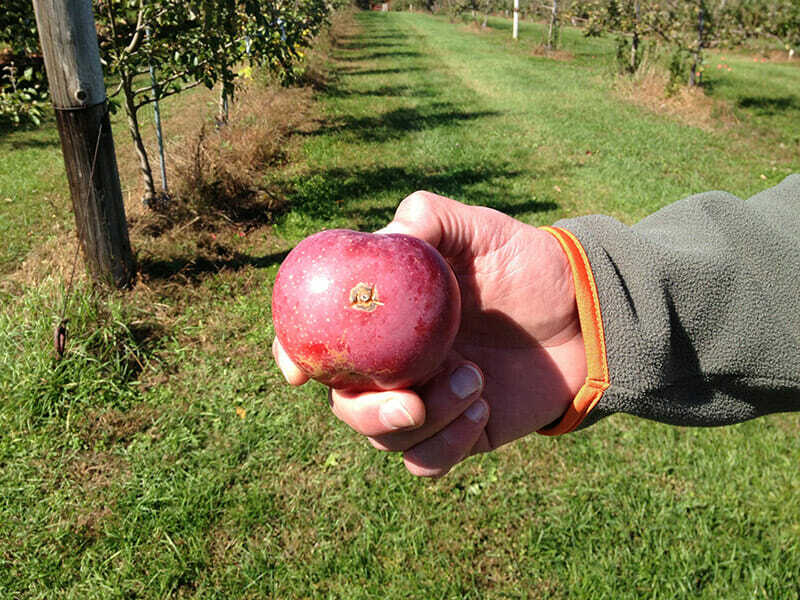 One scab-resistant variety growing in the experimental research orchard at UNH’s Woodman Farm is Crimson Crisp, the product of collaboration among Purdue University, Rutgers and University of Illinois. 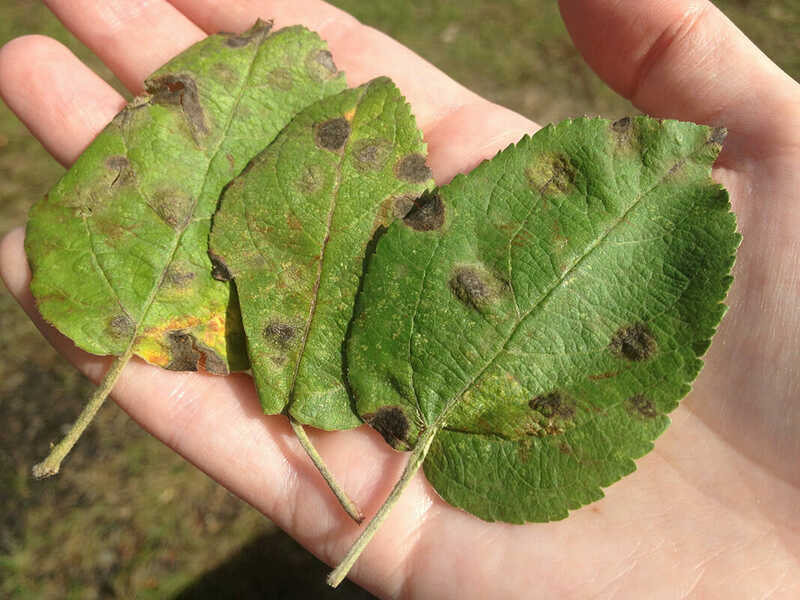 While apple scab is the main concern in the eastern U.S., the multispectral data can also be used to detect other problems ”“ from insect damage to nitrogen deficiency. Pinpointed applications of fertilizer, pesticides and fungicides mean growers are using less, which is better for the environment and consumers ”“ as well as the farmer’s bottom line. The drones could even be used to monitor forest health, scanning for disease or invasive beetles.